Clint Eastwood tackles the real-life tale of a skilled but emotionally troubled war hero in the well performed and fitfully powerful drama American Sniper. Navy SEAL Chris Kyle (Bradley Cooper) saves countless lives in Iraq with his pinpoint accuracy, but struggles to accept his actions and return to normal life with his wife (Sienna Miller, nicely sympathetic in an underwritten role) and children. American Sniper succeeds not only in its depiction of war as brutal and haunting, but also in its handling of Kyle himself. Cooper delivers a stand-out performance that taps into both Kyle’s self-confidence and distress, presenting him as a brawny man with real fears. Unfortunately, the screenplay doesn’t match up. As energetic and realisticly captured as the war scenes are, the home life episodes – where Kyle struggles to re-assimilate outside of the war environment – leave a lot to be desired. Jason Hall’s script lacks depth and resolve, often leaning on well-oiled meditations in an attempt to drive the films tough themes home. 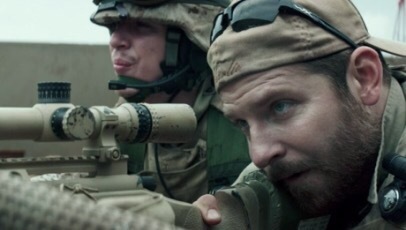 American Sniper is a decent effort on Eastwood’s part to shed light on a hero, but the material simply isn’t up to scratch. I still have yet to watch this! Such a shame that it didn’t live up. Also, I’ve nominated you for a Liebster award – check out the details here, and have fun!